The recent series of disasters in Bangladeshi garment factories over the past several years perhaps got its most alarming and high-profile installment last November when a factory fire at Tazreen Fashions Ltd. — a supplier for Wal-Mart — killed 124 workers and left many observers dazed at the casual supply-chain evils capitalism can encourage. 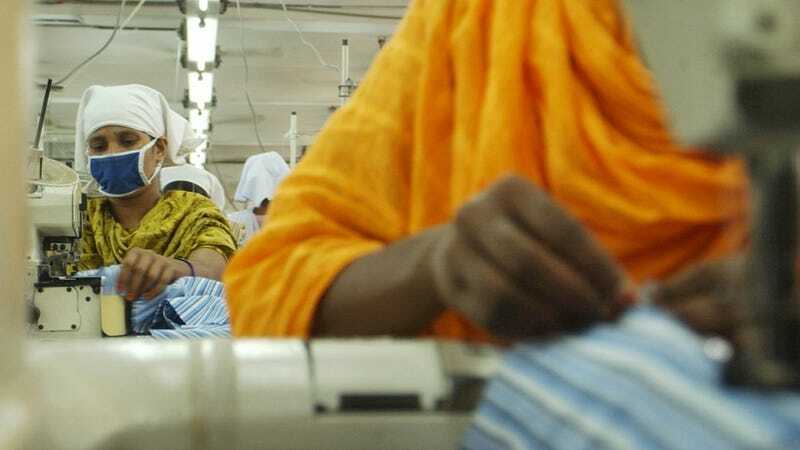 One of those evils, according to an Al Jazeera journalist who recently investigated the aftermath of Tazreen, is child labor: the investigation down the supply chain in Bangladesh garment factories led to a finishing house where children as young as 12 were working. Anjali Kamat from Al Jazeera recently sat down with Democracy Now!’s Amy Goodman and Juan González to talk about an investigative documentary, Made in Bangladesh, part of Al Jazeera’s Fault Lines series. Kamat went to Bangladesh back in June to investigate the aftermath of Tazreen, explaining that her interest in Wal-Mart’s supply chain led her and her team to discover that, generally, at the bottom of retailer’s supply chain, there’s little oversight to ensure that garment workers are working in safe conditions. What we found is we ended up in a small finishing house, where garments are finished. They’re sort of trimmed, and the buttons are put on, the elastic band is put on. It’s the final step before the garments are shipped out. And we found this small finishing house with, you know, one small window, bars on the windows, no fire extinguisher, just a thatched roof, about 25 young girls and boys working there on Old Navy jeans. And we found children as young as 12 putting in elastic bands into Old Navy jeans. When we took our findings to Gap Inc. … Which owns Old Navy. They denied any connection to this finishing house, said they didn’t know about it, and claimed that the products were either counterfeit or had been improperly acquired. But we collected tags, Old Navy tags, at the finishing house, and we matched the barcodes from these tags to products that were being sold at Old Navy stores in the U.S. So, you know, Gap’s claim that these are counterfeit are really—should be called into question.